Not surprisingly, our trip to Berlin revolved around food – mouthwatering, bigger-than-our-eyes sandwiches; oddly curry-flavored, ketchup doused currywurst and creamy, cheesy pastas. And I have to say Berlin truly surprised me with its vibrant food scene! We ate our fair share of currywurst, local cheeses, Turkish snacks at this Turkish Markt as well as modern hipster dishes and drank enough German beer and unknown liquors during our long weekend visit. Generally, we aren’t huge fans of organized tours as we prefer to do our own thing. 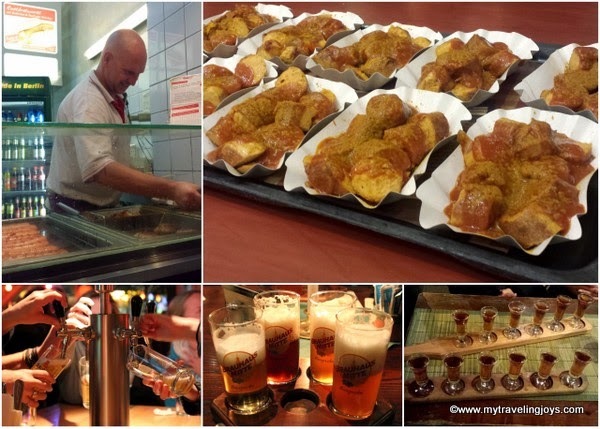 However, once I read about the Original Berlin Food Tour featuring tasty beers and currywurst, I knew we had to sign up. We met up with the tour’s friendly founder Bastian Schwithal and four British couples. We started off with locally made currywurst from a small stall in the Alexa Shopping Centre. As the night progressed, I honestly couldn’t see what the fuss is all about currywurst – German-made sausages doused in ketchup and curry powder. But we had a good crew, Bastian told us funny tales and the food and beer kept coming. Beer and sausages - definitely a fun combination! The main brewery I remember is Brauhaus Mitte located near Alexanderplatz where we sampled 4 different beers, including a wheat, pilsner and a dark one. The night may have gotten fuzzier after this tasting especially after we tried some strange, green-colored shot. This is one organized tour that I can definitely recommend! 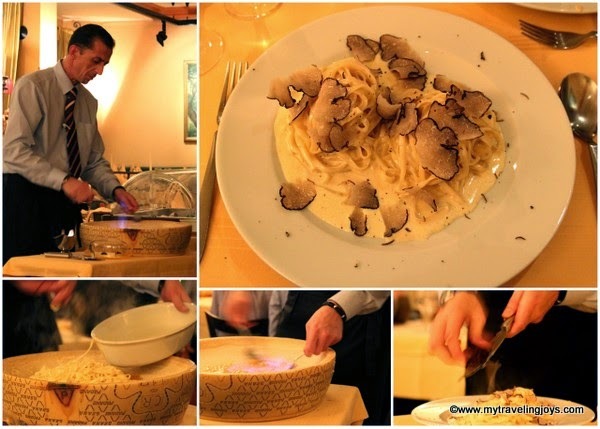 I love Italian truffles, so once two of my expat friends here in Warsaw told me about this fabulous truffled pasta they had in Berlin, we had to go too. Ristorante Via Condotti, Fasanenstr. 73, in the Wilmersdorf neighborhood was a 20-minute metro ride from our hotel. As soon as I saw the pasta being prepared in a giant Parmesan cheese wheel, I knew we had to order this dish as our entrée. The waiter rolls up with the cheese cart, adds some hot cream into the well, scrapes some cheese into the mixture, pours in brandy, lights the whole concoction on fire and then tosses the tagliolini with the creamy cheese sauce. Then, he slices the truffles extravagantly all over your plate of pasta! This dish was a bit on the expensive side at €25 (about $35) per person, but I think it was worth every penny. 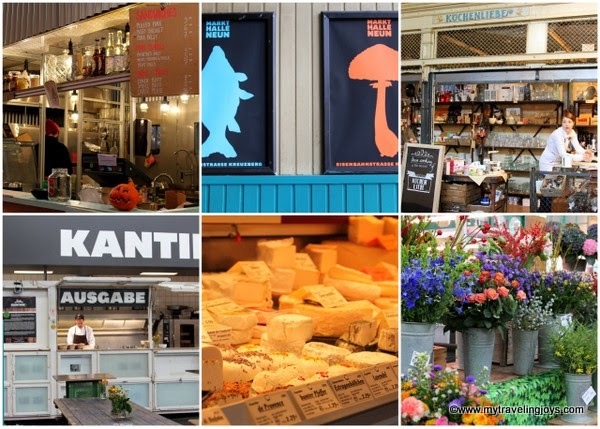 If you’re a regular reader, you know that I love visiting markets when we travel! We popped into Markthalle Neun, Eisenbahnstraße 42, to check out its Saturday’s farmer’s market, which features a variety of stalls selling fresh fruits and veggies, American BBQ, locally-made cheeses, German wines, colorful flowers, forest-harvested mushrooms and more. Originally built in 1891, Markhalle Neun is one of only two historic market halls being used as a public food market in Berlin and one that miraculously survived two World Wars. 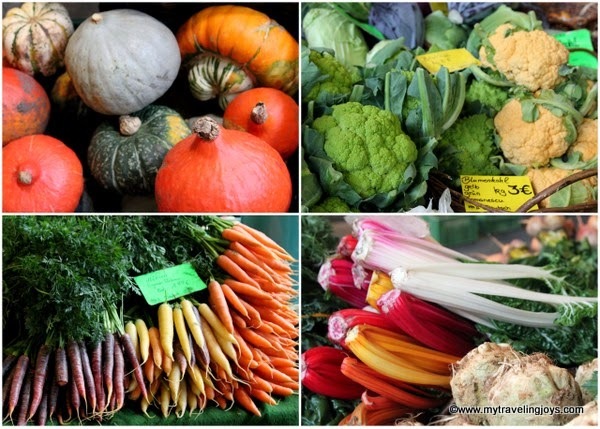 The local producers display their wares on Fridays and Saturdays from 10 a.m.-6 p.m., at the time of this writing. If we hadn’t just eaten breakfast, I would have loved to have tried Kantine 9 at Markthalle 9, which serves a rustic two-course menu sourced from local farmers for only €8 (about $11). You can read more about Markhalle Neun from my French blogging friend, at Cuisine de Provence, with her blog post, entitled: Another Berlin Foodie Hotspot. Before we visited the above-mentioned farmer’s market, we popped into Welt Restaurant Markthalle, Pückler Street 34, for breakfast. This rustic restaurant, located next to the historic market hall, opens at 10 a.m. on Saturdays and Sundays. The menu changes weekly and features nouvelle takes on German and Austrian staples as well as a fantastic selection of breakfast choices. We both ordered the German breakfast that included local Black Forest Ham, eggs and delicious dark German bread. I would have loved to come back here and have a drink at the lovely, Mahogany-stained, wooden bar. Oddly enough, I ate THE best pastrami on rye sandwich I’ve had ever outside of NYC during our weekend in Berlin. I had read about the chic café called Mogg & Melzer, Auguststraße 11-13, in an article in Food & Wine last year, and marked it on my foodie to-do list. This crowded café is located inside the newly revived Jewish Girls’ School in the hipster Mitte neighborhood. Hubby and I waited for a table and then both ordered a large, handmade, loaded pastrami sandwich and savored every single bite. If you’re a displaced New Yorker like us, these pastrami sandwiches will make you feel like you’ve landed back in a Jewish deli in NY. 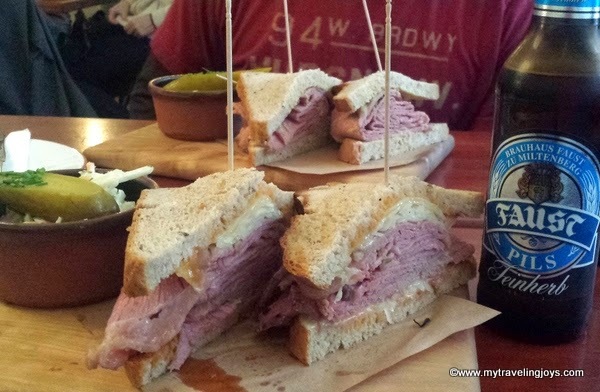 In fact, I’m still salivating over these sandwiches as I write this blog post! Even though fellow travel-savvy friends had raved about the food and art scene in Berlin, I didn’t believe them until I experienced it all first-hand. We will definitely return to Berlin and hopefully soon! 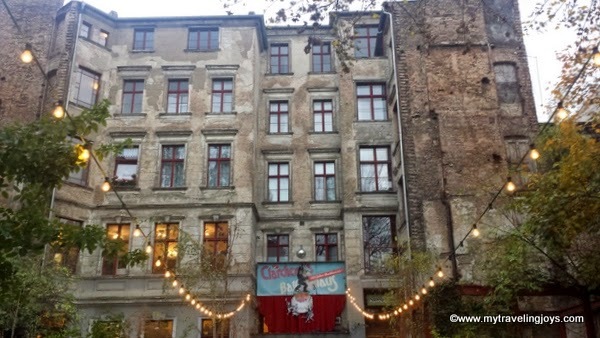 There are many pre-WWII buildings like this one in the Mitte neighborhood of Berlin. My neighbour in Bodrum lives in Berlin and has been telling me for years how good the food is - Guss I'll have to believe him now. i would have dived into the middle of the flaming cheese! i have a friend that tells me i haven't lived until i visit berlin. i've been all over germany but never made it there. Mmmmm Berlin food is not typical German food, and I 100 percent love that. It's owrth a visit alone for the wild food! Yes, the pasta was pretty amazing! Berlin was quite different from the few German cities I've seen so far, but I loved it! @Alex, totally agree with you! I hope to exploBerlin some more!